I want to share with you what I prepared for Eaton for December Gingerbread Man Theme. 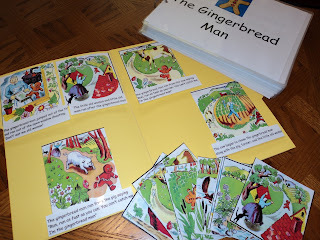 1) The Gingerbread Man Story Book I created that book based on the Gingerbread Man story I found free on Internet. You can change the size of the book to smaller one if you prefer (sometimes I use 7"x5"print). 2) The Gingerbread Man Power Point Presentation If you prefer not to print out the book. 3) Gingerbread Man Sequencing Cards I printed out 2 sets of cards. One set I laminated in order to use them with the book. I read the book and Eaton is trying to find a card that represented read paragraph. Second set I use with a file folder matching game. 4) File folder Gingerbread Man matching game (sentences to pictures). You need one set on sequencing cards and corresponding sentences you can find here. 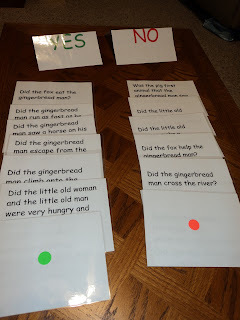 5) The Gingerbread Man YES/NO Game It's a self correcting activity. How do you play it? You give one card to a toddler. He/She reads that card and states if its true or not by saying YES or NO and put it in the correct pile.True-YES, False-NO. I put color stickers on the back of each card for a toddler to see if that activity was made correctly. 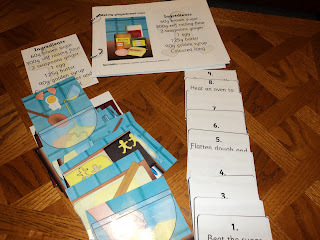 At the end of a game you can ask toddler to count cards in the YES and NO pile (simple math activity). 7) Gingerbread Shape man I printed out these shapes on brown card stock. 9) Spelling cards You can practice spelling words with your toddler (My Eaton started to spell recently by himself. I think he picked that spelling from alphabet songs. 10) Popsicle Stick Puppets This is black and white version. 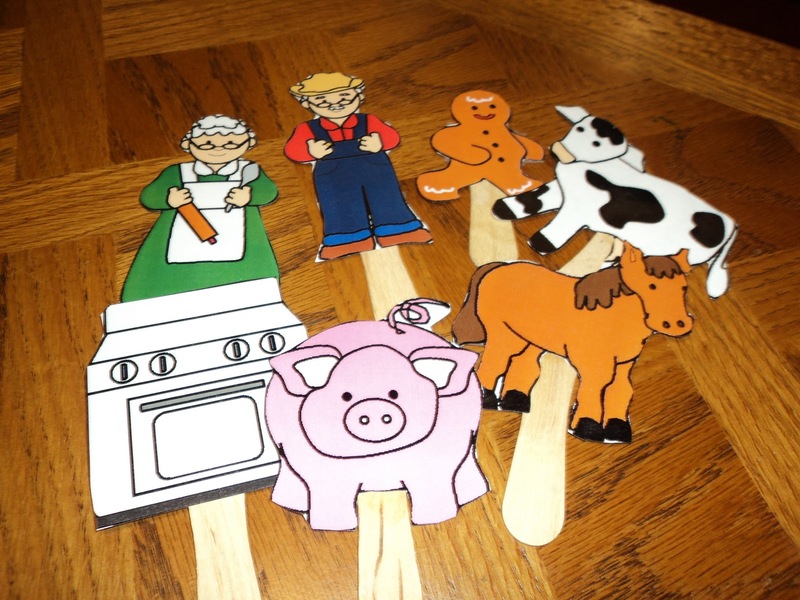 I prefer color one so I printed out another set of Spelling cards and cut out characters and glue them on the ice-cream wood sticks. 11) Gingerbread House Gift Box You can put some Gingerbread cookies for your toddler! I keep cards on the back in the envelope attached to the book. 14) Gingerbread house math activity This is great activity for older toddler who will understand graphs (math) and will be able to color squares. I will represent that activity to Eaton for sure when he will be older. 15) The Gingerbread House Shape Match Some of these pieces are very tiny so that activity would be probably good for toddlers above 2 years old. I printed this out because my baby loves shapes. Pretty soon he will be ready for it. I hope that you like some of these ideas. Enjoy! Now, I'm going to the kitchen to make some gingerbread latte!! I've got something to confess. A few posts ago you announced that you were going to prepare a ginger bread man theme and I though that since your activities were always so well prepared and lovely I would just wait instead of doing it myself :-). Then I thought it would be outrageous to do nothing and wait, so I decided to prepare my Rudolph the red nosed reindeer theme. 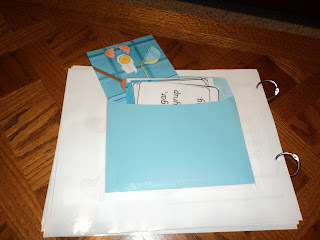 I'm going to share it on my blog as soon as my new laminator arrives. I hope you don't mind if I describe your ideas for the "GINGER" on my blog ( making appropriate references to your site). If you do, please let me know. Warm hugs from Poland covered with loads of snow. Go ahead and do it. I don't mind at all. The point is to share with others. I'm glad you write more on your blog now! Could you post the link to the book? I've been searching for it & can't find it. Thank you for these resources!! I will use them in class. Thank you SOOOOO much for the Gingerbread Man book printie. I have been so frustrated trying to find a free printable of this book(I knew they were out there somewhere). THANKS again!